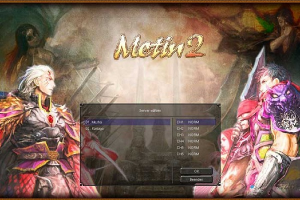 "A Massive Multi-player Online Role Playing Game"
Metin2 is a role-playing game that allows you to enter the world of oriental mythology and fantasy. It is a world where you must become the most powerful warrior to be able to defeat three tyrants. These tyrants are strengthened by the dark forces of the Metin Stones and are causing terrible damages to your world. You will have to battle these tyrants in order to bring peace back to the world. This game offers a variety of martial arts weapons that you can use, such as swords, bows and spears. You can choose which type of martial art you want to use. This could be Karate, Taekwondo or Kung Fu. Metin2 lets you select between four classes of characters: you can be one of the Suras, who are fighters that use black magic; you can also be a Shaman, a witch doctors; you can choose to be a ninja, who is very agile and extremely fast; and finally, you can become a warrior, who has great physical strength. This game has incredible graphics and is based in oriental lands. There are amazing buildings, and backgrounds, laced with oriental symbols. If you like martial art games, then you should probably try Metin2.